Location:Seattle, Washington & Walla Walla, Wa. Interests:Martial Arts, Yoga, weightlifting, Frisbee and fun with my pup Coyote Crow Dog, cooking, art, languages, math, science.....the list goes on. James Teit's research at Telegraph Creek in 1915 showed that there were only a few Tahltan bear Dogs left in existence, in the early 1900’s. He was concerned that they would soon be extinct and asked that they be recognized as a distinct, culturally important breed. By the 1930s they were quite common once again, thanks to Teit’s warning. Around 1939, British Columbia Provincial Police Commissioner T.W.S. Parsons and Constable J.B. Gray petitioned for the Canadian Kennel Club (CKC) recognition of the breed and they were accepted. Several years later the American Kennel Club (AKC) added them to their list as well. Unfortunately these two registries neglected to pay attention to the decreasing numbers and the education they could have given the Tahltan breeders to save them, even then they were not interested in saving, but promoting a larger population for their marketing agenda’s. Through the 40’s and 50’s there were fewer and fewer registered or even seen in the areas where they were quite common just a few years before: Northwestern British Columbia, Atlin, Ross River, Whitehorse, Carcross and Southern Yukon. By the late 60’s, when I was in Canada searching for any Tahltans that may be left in the back country, to add to my AIDog gene pool, there were only a few to be found and they were usually fixed or too old for breeding. Most of the sightings that I followed up on were usually modern husky crosses or Village Indian Dogs that at that time were still fairly prevalent in the north, used in long distance sled dog racing. Many people also mistakenly thought that the Hare Indian Dogs were Tahltans and even later unknowingly put a picture of a spotted Hare Indian Dog on their Canadian stamp that looked like a Terrier/Hare cross. I suppose they didn’t know what a true Tahltan looked like at that point in time. Plus they didn’t realize that Indian Dogs were not spotted back in pre-Columbian times, so this was not even an Indian Dog at all, let alone a Tahltan. I had also learned in my research that Tahltans were very similar in looks and personalities to the Pueblo Dogs, just shorter hair in the Southwest, that I had already found. Read; “New Research Exchanges, Tahltans” to solve this north / south connection. There were rumors of a fellow named Tom Connolly of Atlin and Ross River, a large game hunter that used the Tahltans for hunting Bear and Elk, for 30 years or more. When I finally tracked down Tom Connolly, he was very sick at that time and didn’t know of any more other than the few he had left by then and they weren’t registered. His wife Shirley gave me 2 of his Tahltans in 1970 after Tom’s death and these were the 2 that were integrated into my breeding program, these were a black and a blue. Ms. Connolly later sold all of her 4 Tahltans to a Lady friend that moved with these Tahltans to Southern CA., where we traded some breeding’s later. It was around the late 70’s that the Rare Breed Dog assoc., based in Southern CA, tried to take these last Bear Dogs from Shirley Connolly’s Lady friend including the stud book, passed to her from Shirley. In order to start a Tahltan breed club of there own “to revive the breed”. We all new they would ignore the controlled selective breeding it would have taken to actually “revive” them. Shirley once again warned me that CKC and AKC would not listen to her husband Tom back when there were enough numbers left to save them and in 1974 AKC rescinded their recognition as a breed, after 26 years with no new registrations. It seems they would not allow Tom to register his Tahltans as they were not recognized in AKC’s or CKC’s “closed” stud books. She was so angry with these big brother registries and told me of the hassles Tom had experienced with both CKC and AKC not allowing his Tahltan dogs to be included in their stud book. The breeders and clubs that REALLY cared about saving their breeds had finally realized these “pure blue blood” registries were not interested in small numbers of some “Indian Breed” and were only interested in large numbers of “popular” politically correct dogs. Breeds that could be promoted and marketed and inbred in every ones back yard for AKC’s financial gain. There were so few Bear Dogs left at that time that they would have been inbred to the point of them all being related the same 4 already related dogs, turning them into unhealthy inbred mutants. That was my first lesson in BIG BROTHER and its rules of not opening the stud book to different Tahltan bloodlines, letting in any new bloodlines to even an almost extinct breed that was already at risk. At that time there were at least some that were ¾ pure Tahltan, they could have at least used them to save them as a breed, not even including the other pure Tahltans of the Connolly’s. I’m at least happy that some of these special Tahltan Bear Dogs blood is still flowing within our AIDog breed. Towards the end of this article we will see if the Tahltans are truly extinct or can possibly still be saved, even if in a less “pure” form? McKenzie (Mac) my 1/2 Tahltan breeding Male from the 1980's. Notice Mac, on the left, with the 3/4 brush tail from his Tahltan blood. In 1986 I tried once again to reach out to The Rare Breed Association for recognition and help to save the AIDog breed, supposedly a “breed” is not considered “real” if it is not excepted by AKC. To be excepted by AKC you must first give up your stud book to a Rare Breed Club (1st in the Chain of Command) to then be AKC miscellaneous; (2nd in the Chain of Command) and of coarse the ultimate AKC at the top of the “Politically Correct” ladder of being “real” is AKC. Once again after 2 years with them they wanted me to turn over my stud book, go with AKC and their marketing agenda rule, giving up complete control of the selective breeding program that was so important for the health and the actual “saving” of a special on the edge breed. My 3rd lesson with BIG BROTHER was in the early 90’s when two lady’s tried to start their own AIDog club and take them to a newly started Rare Breed Club based in Washington DC. These promotional marketers again wanted to take over the AIDog stud book and would not give the AIDog club founder/board of directors control of its own breeding program, using our own code of Ethics and rules that had to be set up in order to actually save them. Needless to say I told them what they could do with there ideas of making the AIDog one of the most popular breeds in the world … increasing the marketability by inbreeding to create all the same colors and all blue eyes … etc …etc. Ya, right, that’s just how to ruin a breed, not save it; just like they’ve done with all of there breeds once they get their hands on them and start there promoting, marketing programs to increase there popularity, for their financial agenda’s. Yes, any breed has to at least be popular enough to a select few special owners to maintain and pay for itself, but not marketed to the point of back yard breeders, breeding mothers to sons and fathers to daughters. Including the show breeders; breeding to just a couple already inbred conformation favorite champion sires and dams … over and over and over generation after generation until they become one carbon copy clone of each other …. with many genetic health problems, both in the body and mind. No thank you! 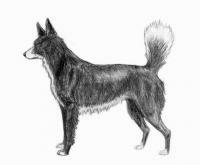 Now at this time in 1998 the Tahltan Bear Dog breed is generally considered to be extinct. This belief was decided by the Guinness Book of Records, which for several years tracked the last few remaining Tahltans and at there death declared them “extinct” … but are they extinct … or was it just the CKC/AKC registered ones ?? The definition of extinct is clear enough, but how did Guinness know this …. did they take CKC/AKC’s word for it …. what exactly is a Tahltan bear Dog …… did they even bother to ask the Tahltan people themselves? Would the Tahltan First Nation's people even tell them if they had any more of their Dogs, after these registries didn’t even take care of the ones they had before or even listen to the warning of those that new the breed?? I think the Tahltan peoples have learned their lesson also with BIG BROTHER, like I have with the AIDogs and wouldn’t say even if they did have some left or a breeding program of their own. When Canada had its bi-centennial celebration the CKC called me to “borrow” any dog I may have that even resembled a Tahltan Bear Dog. I told them it was too late, they should have saved them and listened to experts on the breed 50 years ago if they expected them to still be in existence today, for them to “borrow”. I also suggested they, “go to the Tahltans Nation (with their tails between their legs) and ask them if they still have any, but don’t expect an honest answer because of your track record in NOT saving the one’s you had in the first place”. They ended up with a Newfoundland at the bi-centennial celebration, that was a combination of European breeds put together and developed in Canada, later becoming Canada’s National Dog … what a shame they blew the opportunity to have a real “First Peoples” Canadian bred National Dog that was very worthy of saving. These Bear Dogs seem to have been widely traded, and dogs resembling them are mentioned occasionally in early coastal literature, along the west and east coasts. 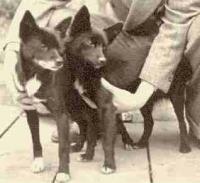 These were the smaller forest type hunting dogs, that were probably related to the Tahltans to some extent. There are even myths of some Klamath Indian dogs with short tails, that would lead one to believe they had some Tahltan blood in them as well. Their smaller size made it practical to carry the dogs in packs while hunting, releasing them only when game was near, or at night, when they would guard the camp. Although they were generally carried in moose hide backpacks, chest packs were occasionally used as well, possibly for smaller pups training them for the hunt. It's generally reported that the dogs were carried to conserve their energy, plus slept with at night to keep both 4 legged and 2 legged’s warm. Plus the high social value of a Bear Dog makes it likely that status for the owner and protection of the smaller dogs from the larger Village Indian dogs was important. Besides with their very affectionate nature ….. I’m sure it was a pleasure having them close at night or riding with them in their sleds also. The Tahltan Indians of northwestern British Columbia have had dogs around their campfires as far back as their oral history goes, and they were adept at specialized breeding of their dogs, as all the First Nations Peoples were, through out the North and South American continents. These dogs, as the Pueblo Dogs and other types, were used to locate game, either herding game back around to the hunters or harassing the target animal with their high-pitched, staccato barking and unpredictable darting and nipping, until the hunters arrived with their bows and arrows. They were most famous for their bravery and dexterity around both black bears and grizzlies. Bear Dogs also assisted in hunting everything from beaver to porcupine, ptarmigan, deer to elk, very similar and possibly related to the Lund Hund’s (hunters) and the Icelandic Sheep Dogs (herders) of today. These two modern breeds were developed in those two separate directions … and chances are they are all related, to some extent, to the old Vikings Dogs. These dogs traveled with The Vikings two thousand years ago to North America, Canada, Greenland Iceland and Nova Scotia, along the coast. Winter and spring hunts in particular were made infinitely easier by these dogs, which could run easily on the thin crust of the snow or go down into the borrows after game. Before a hunt, the dogs were ceremonially bled by sticking them in the hindquarters with the sharpened fibula bone of a fox or wolf, also used as a needle for sewing. The morning of the hunt, two dogs were carried in a sack over the Indian's shoulder until fresh bear tracks were sighted. Upon release, these little dogs moved lightly over the crust of snow with there large hairy webbed feet, while the bear was slowed down by the deep drifts. Their high pitched yaps harassed the bear into submission confusing him into climbing a tree or until the Indians could come close enough for the kill. To prepare these brave dogs for a fight against big cats, a claw from a dead lynx was used to ceremonially mark the dog's face, convincing the big cat that this was his last battle scars from the last cat encounter that it had survived. The Tahltan Bear Dog had the courage to face a bear, but was friendly and gentle with smaller animals and with humans. The most famous example is certainly in “Stickeen”, by California environmentalist John Muir. This small book describes a dog which accompanied him on a trip across a glacier near Fort Wrangel in 1880. “Stickeen” ; "a perfect wonder of a dog that could endure cold and hunger like a bear, swim like a seal, and was wondrously wise and cunning”. They lived in the tent with the family, sharing bed and food. A Jesuit of the 17th century described the Indians communal houses in winter saying he, "could not decide which was worse; the smoke, the fleas or the dogs." Believed to be partially descended from pariah-type dogs (and later on in my opinion Vikings dogs as well), that had come with prehistoric migrations, and crossed with dogs already developed by primitive man in the Americas. The Tahltan Dogs were mainly centralized in the remote mountainous areas from northwestern British Columbia and up into the southern Yukon. (Read in “New Research Exchanges .. Tahltans” in another article to learn more of the southern connection as well.) Their usual diet was small bits of birds, meat and fish, and they flourished in the bitter cold. As white explorers came into the territory, bringing a variety of other dogs, the Tahltan Dog became diluted and succumbed to many European diseases, as many of the Native Dogs, and people, they were not immune to these new European diseases. Like others of their primitive types, they had a peculiar yodel and very foxy in appearance, their main distinction among dogs is their novel tail. Three quarter length short bushy and usually carried erect, (never curled) it has been described as a shaving brush or a whisk broom. A Tahltan Bear Dog was primarily black, dark brown or blue (lead), with some white patches on the chest and sometimes the feet. 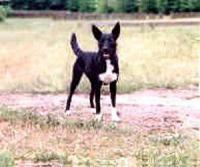 Standing 14 to 17 inches high at the shoulder, with relatively large, erect pointed ears, with a refined, pointed muzzle. The glossy coat was of average length, with guard hairs covering a thicker undercoat. Paws some what webbed and relatively large for the size of the dog. They were also double jointed and gaited, enabling them to switch gaits as they moved through different terrain or heavy brush, ……. as all the aboriginal dogs of the north and South American continents; were bred for their ability to change gaits to adapt to different terrains or distances. Known for climbing trees after game and dragging it down out of the tree, also great swimmers, pulling out beavers from their dens and herding fish into nets. They were specially adapted to swimming and liked water, compared to the Village Indian Dogs that were bred to avoid the freezing water. The Plains Indians valued these dogs to breed with their dogs, combined with the slightly larger Common Indian dog types created a more practical, agile athletic medium sized dog they could then trade back to other Nations ….. crossing them back again. Then trading there offspring once again to the same Nations that they traded with earlier, and on, and on to get the perfect balanced gene pool … for the perfect dog to travel through life and time with. Warning: there are people trying to market fake Tahltan dogs now … Just like the people trying to market their wolf hybrids calling them - Native American Indian Dogs or NAID’s, American Sheperds, North American Indian Dogs. Please do your research before you are fooled into investing in something that isn’t even close to what they represent them to be, thanks for doing your research. There will be an up-date soon from the Tahltan people themselves and some of the research we have shared …. about the southern/northern relationship of the Tahltans and the Navaho’s and how they used to trade dogs and are both part of the Dene language groups of First Nations peoples. This is why the Tahltan Bear Dogs and Pueblo dogs are so similar to one another. by Heyday Books, Berkeley, CA. * Teit, James A., "Field Notes on the Tahltan and Kaska Indians, 1912-15,"
I told her that I had a female that had a large amount of the old Tahltan blood in her from way back when I had my pure bloods. I also used another Lady’s Bear dogs to breed from, in Southern CA in the 1970’s …. she of coarse recognized the Lady’s name and had heard of Tom Connolly and the story behind him, after comparing note’s, that began to create more connections. Recalling story’s of a Long Hair young man they called “Dog Man” searching for Indian dogs with a Plains dog that was always with him. (Could that possibly have been me?) Plus lots of people know of the story of the Lady that had 4 Tahltans that gave me breeding’s in southern CA., that had told the Rare Breed Assoc., at that time that they had all died. This was so they would leave her alone and not actually steel them just to breed these 4 very old and already closely related dogs together just to market them with a closed stud book. This is what started the myth that Tahltans can’t live out side of there home range, they are accustomed too …. or they will die. This was a story to keep BIG BROTHER from getting there hands on, and controlling Native dogs, turning them into carbon copy “pure” blue bloods. I told Camille I would be happy to donate my female if it would help give them more bloodlines for there gene pool and, for “The Cause” of saving the dogs. I had saved 2 daughters from her and would have retired her soon any way. Besides not only was she a high % of Tahltan, she also had a lot of the Pueblo Dog blood too. I thought the Tahltans and Pueblo dogs had to some how be related, because they were so much alike in conformation, size and personality qualities. After we discussed this strange coincidence of, how both old type dogs could be so similar in pre-Columbian times, but yet lived so far apart, we eventually put it together as fallows; - Both the Apache and Navajo peoples of the southwest are distant relations – Tahltans are Dene people and they say Dine but the languages are closely related both being of the Athapaskan Language family. Tahltans have quite a few stories in their oral traditions about the Navajo but the Tahltan and Apache language have incredible similarities according to a thesis done a few years ago by a person of Apache descent at the University of BC. The tahltans oral traditions talk about the Navajo visiting with them as recently as a few hundred years ago, and according to feasting traditions it would have been the custom to gift them with prize dogs. The people in Teslin, Yukon have oral traditions talking about descending from the Tahltans and moving up to the Yukon because of a dispute between them. These people also have or had Tahltan Bear Dogs as do or did the Taku River / Tlingit people located in between both of the Tahltan Nations so although breeding was very closely guarded, we believe that they did gift some of their Bear Dogs to distant family members, but that is conjecture based on the knowledge of old traditions. So in my opinion it all makes since and comes together …. These two Nations and others had a trade rout from Northern Canada all the way to the southwest US and into Mexico for thousands of years, trading cultures and many things, including dogs. This was also happening even more so with the Plains Indians as they traded far to the North, South, East and West with dogs. This is also why all the dogs are so similar to one another and why the Plains Indians were the main dog and later horse breeders, as they were located right in the middle of the Continent. Another theory comes true and the world gets even smaller than we thought and we keep learning how connected we all are with one another more and more. I donated one of my dogs to Camille to use in their breeding program, it was really nice to meet her when she drove down to pick her up, and look forward to hopefully meeting again. Plus it’s great to share research and old pictures with others that care about keeping the Old Ways and Old Dogs alive, passing them on. I hope to get more of the Pueblo lines from the Tarahumara Indians, including them into the AIDog bloodlines and possibly give one to the Tahltans to maybe use in their breeding program also. Good luck to them as it is not easy in these modern times to deal with BIG BROTHERS turning them into blue blood mutants trying to take them away from you or the WANT TO BE’S marketing fake hoax, Indian Dogs. The photo that you have captioned "The Last Tahltan Bear Dog in the CKC Registry" is simply an image stolen from my Web site at http://www.everythin...es/beardog.html Posted in about 1999, it is a tiny portion of an image shot at Teslin in the 1920s - from a collection at the Yukon Archives. Interests:My AIDog Chhaya...herbs, gardening, the outdoors. I have read Kim's website completely and read "your article" on your website....it's VERY CLEAR to me, Kim has done his research and the proof is on Song Dog Kennels website....I believe what he is doing and the info provided is true. As far as the photo being "stolen"...may I ask how you were able to get the photo? I would imagine that with all the research and people that Kim has been in contact with over the years he was able to access this photo from....a collection at the Yukon Archives. just as easily as you. Forgive me, my intention is not to offend, the truth is VERY obvious....Song Dog Kennels and Kim La Flamme and those who work for him have their hearts in keeping these dogs as pure as possible....your website doesn't reflect that to me. So please, before you get on the Forum accusing someone of stealing pictures could you read through the whole website of Song Dog Kennels first and ask how the info was retrieved. We have removed the picture in question, pending investigation. One could argue that evolution suggests were not idiots, but I would say, Well, no. Evolution just makes sure were not blithering idiots." First, you will note that we have replaced the picture in question. Secondly, as Mr. lundberg so rightly points out, these are archive pictures, and as such, belong to everyone. Thirdly, Kim La Flamme has been sent this picture many times through the years. In fact, if you will look at all the pictures within Kim’s articles about Tahltans and read the information, you will notice that he has collected pictures starting in the 1960’s and they are all either from archives, (open to researchers or the public) or from Tahltan and Old Crow First Nations Peoples themselves. In the 1980s, Kim was sent this picture, with permissions, from William Pferd, author of "Dogs of the American Indians". Several people have sent this picture to him over the years spanning 1960-2010, most recently, from a "First Nations Tribal member, Tahltan, and owner, ex Tahltan Bear Dog breeder" from your own area. Fourthly, you might have forgotten that you actually quoted Kim after emailing him, by saying most of the recreating of the Tahltan dogs are a scam. He was referring to some dogs; "example is the Black fuzzy dog, not the part Tahltan bloodlines that he already has or can still find in the Yukon area and BC. The pure one’s, of course, are all gone, but some part bloods still remain." In Kim's emails to you, he also sent you that picture of the stamp, with explanations of why this is not a Tahltan Bear Dog. Yet you have rewritten these exchanges as your own ideas and words. Kim, on the other hand, gives you credit, Mr. Lundberg, for your time and conversations, at the end of his article. Kim has always tried to give credit where due, and has been free with his knowledge, even though many of his contemporaries, have jealously tried to "own" history, and stolen his reasearch, reprinting it as their own. And last but not least, the internet archives reveal that this picture in your article, first show themselves on February 5th, 2001, while Mr. La Flamme first published his article in 1998. "This picture is meant for the public to enjoy, as you have on your web site, as I have, as do all of us concerned with preserving the history of the dogs in the Americas--for all people to enjoy and understand into the future".